Always good to see old friends and break bread together, but even better to do it while sharing a New Zealand adventure! 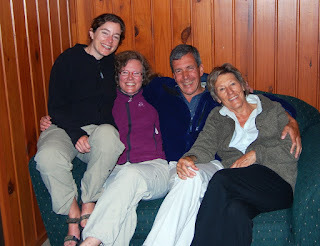 After the Kepler Track, we were quite tired and checked onto our room at the YHA. To our pleasant surprise, we were assigned to a small house complete with kitchen, grill, deck, and facilities. Only one other couple was sharing the other bedroom. Much better than the normal "shared facilities" in many places we stay. I awakened to see 2 faces peering in at me. Who is it, our roommates? Why are they so impolite? Their voices sounded familiar, and then I realised it was a relatively unexpected visit from Karin and Katharina, our friends from years ago when we all lived in Shanghai!! Off we rushed to the food store to get supplies, and then a feast was prepared. Pat grilled veggies and a large salad was prepared. 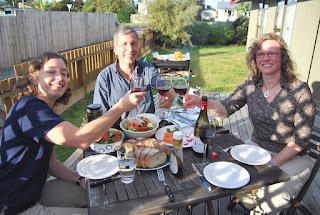 Dinner was accompanied by fine New Zealand Wine and lots of stories. Early the next morning, I drove the the ladies to the start of the Kepler Track. Their experience was to be different from ours... the email later from Karin read "rain, hail, tornado winds. It was crazy wild, but we decided to hoof out and skip the beach day because of the rain. "